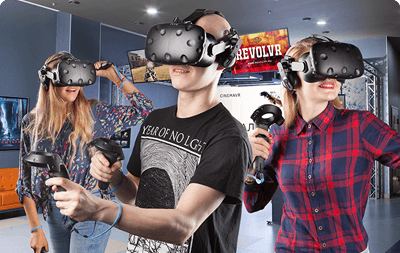 A four-player PlayVR VR arcade machine is made of standard components sourceable in every major city on Earth. It has been designed to ensure fast interest generation, quick predictable throughput, player retention and ease of tech support. In other words, it will return your investment and start making money really quickly. Click the hotpoints on the image to learn more. All equipment is suspended on the truss. 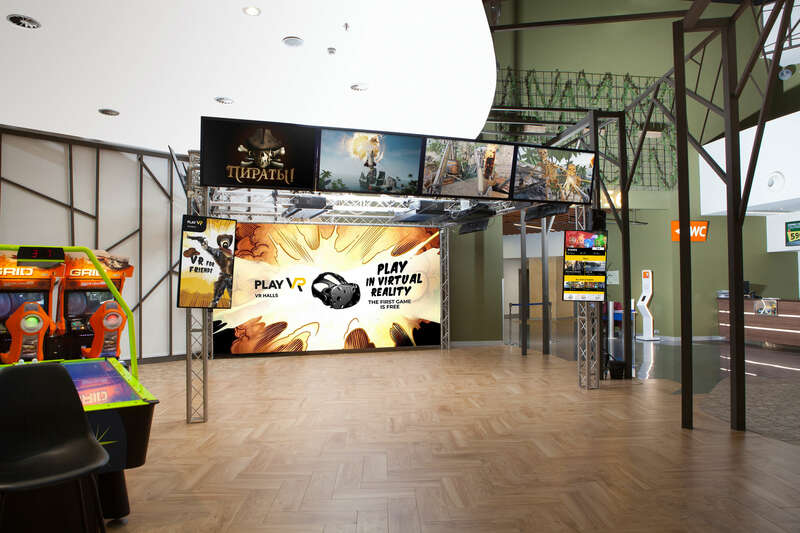 No cables on the floor, theft protection and hanging headsets: optimised for the best maintenance experience. 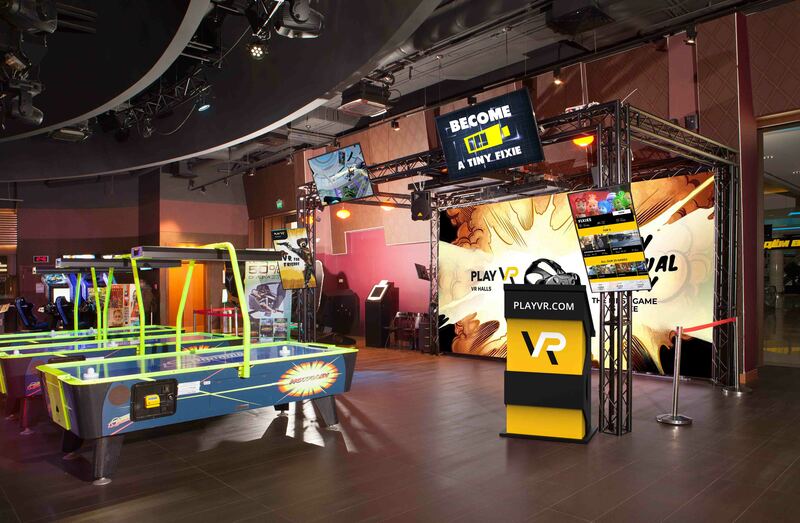 Optional but recommended, the metal truss not only holds what is necessary for PlayVR itself, but also allows you to quickly customize the set up for special events such as children parties. 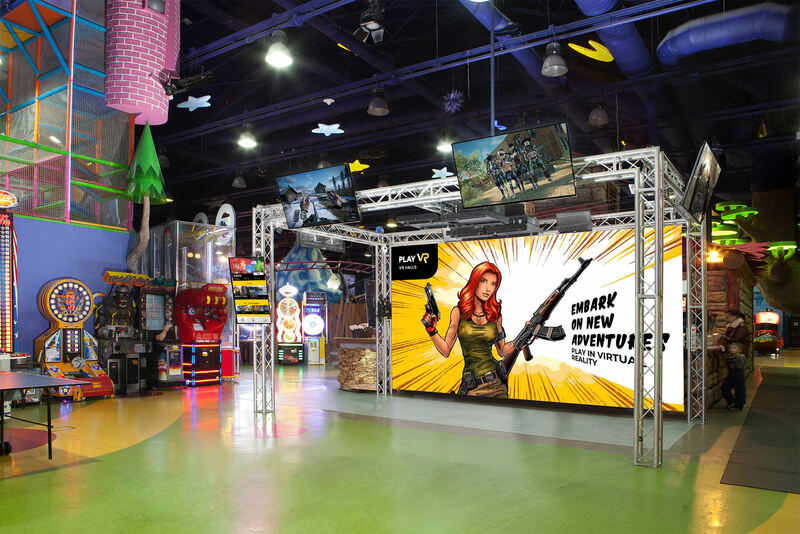 When no one is playing, they work as fully controllable video advertising screens. 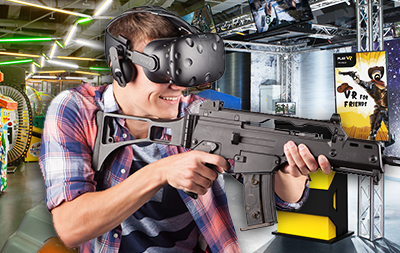 In game mode, they show first-person view of every player, bringing more people into the game. 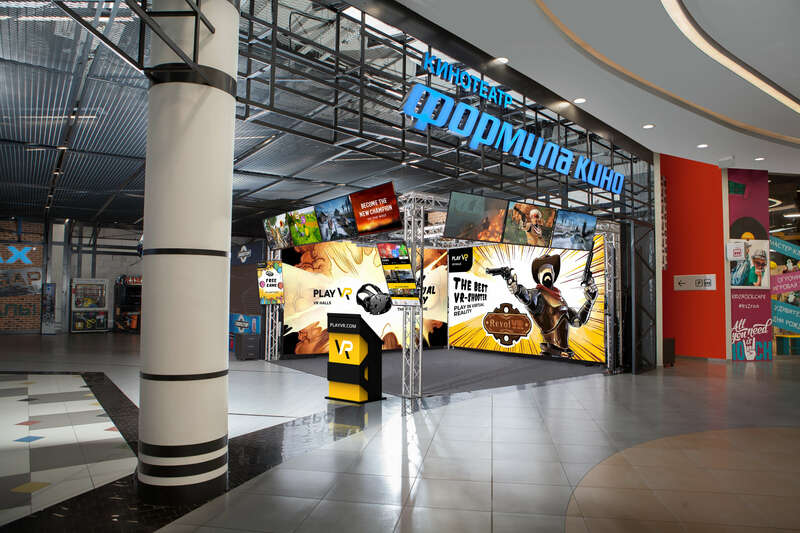 The screen, which shows three types of billboards: all games, Top Games and "user selection." The last two are customizable. We decide which games will be more popular only by placing the appropriate billboards in the TOP list. 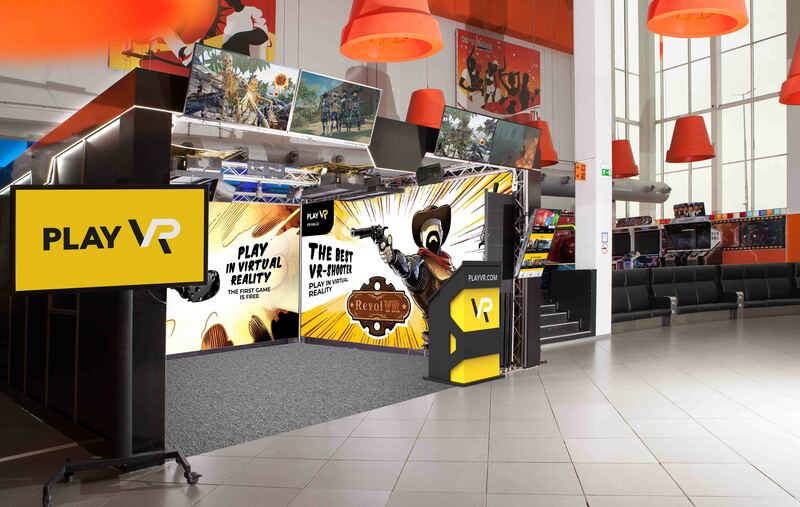 Choose among ready-made designs and ensure your PlayVR is well-presented and protected from external light interference. 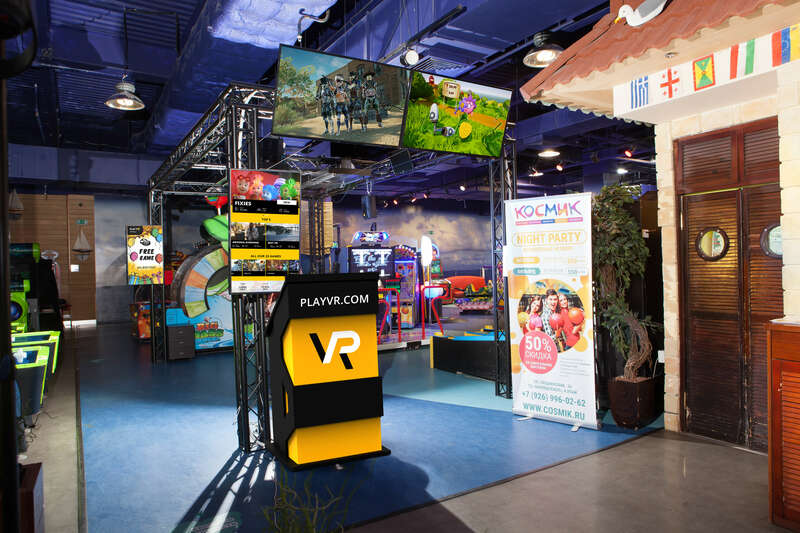 The rack with the PlayVR logo and a large number of voluminous hinged pockets. There are a lot of different booklets. 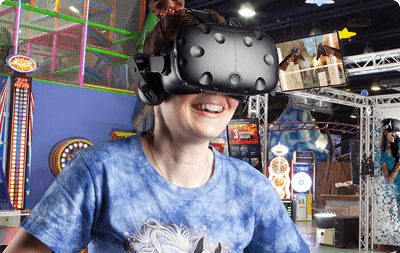 They may relate to assortment of games for the holidays, special offer for tickets or about the VR-tournaments. In the pockets, you can also put booklets and business cards of partner offers, logically related to the games of network. 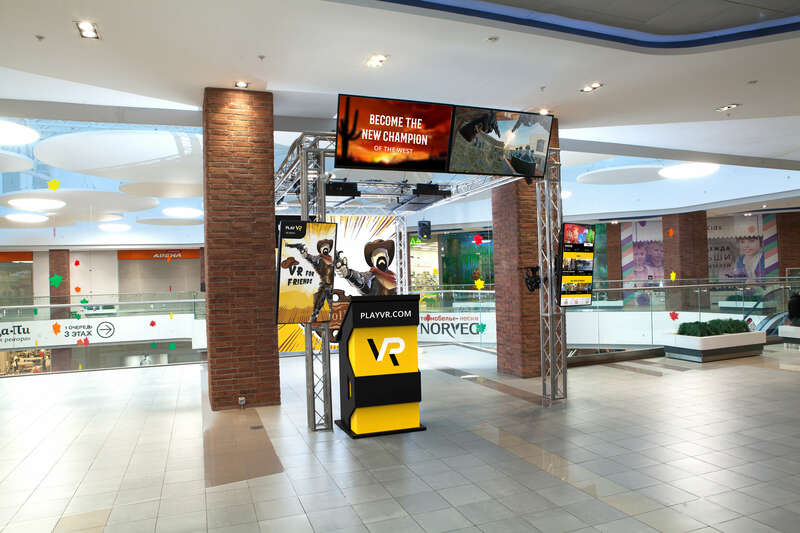 Fully controllable from a tablet, the interactive poster captures attention by showing game promo, discount info, latest releases or whatever else you wish it to show. An optional layer of soft rubber prevents unfortunate accidents and also makes the floor easier to clean. 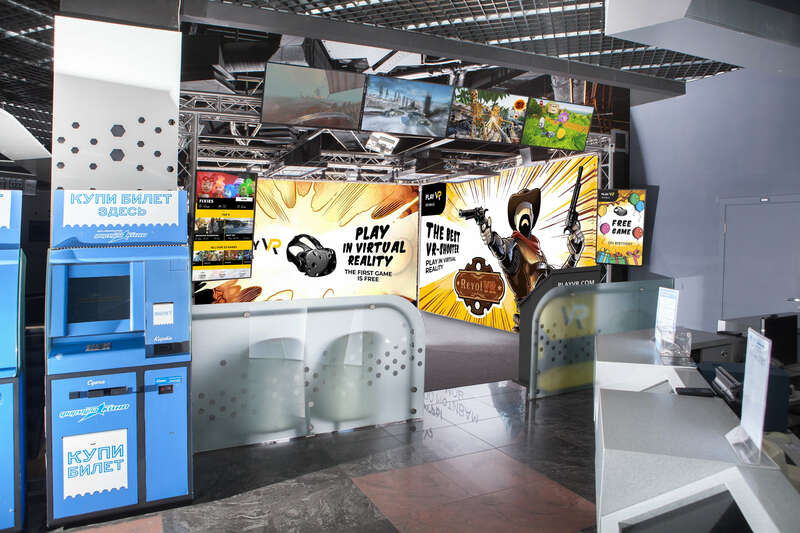 To the right, a second vertical screens shows animated banners with customizable gaming choices. This is the choice menu for the customer. Dubbing as a safebox or staff bag holder, this desk is the workplace of your personell. 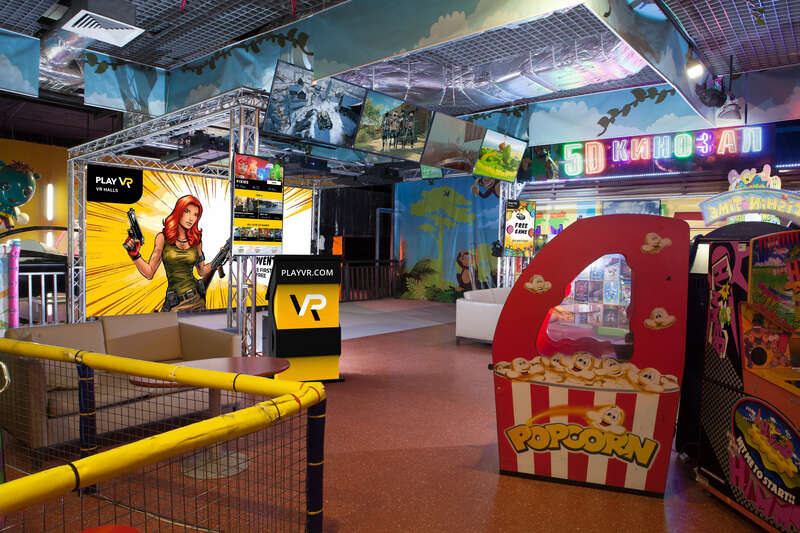 Our software partner, Play VR, provides the X Arcs with premium content and a top of the line attraction management tool. Operate one or several X Arcs as a single chain with ease and efficiency. 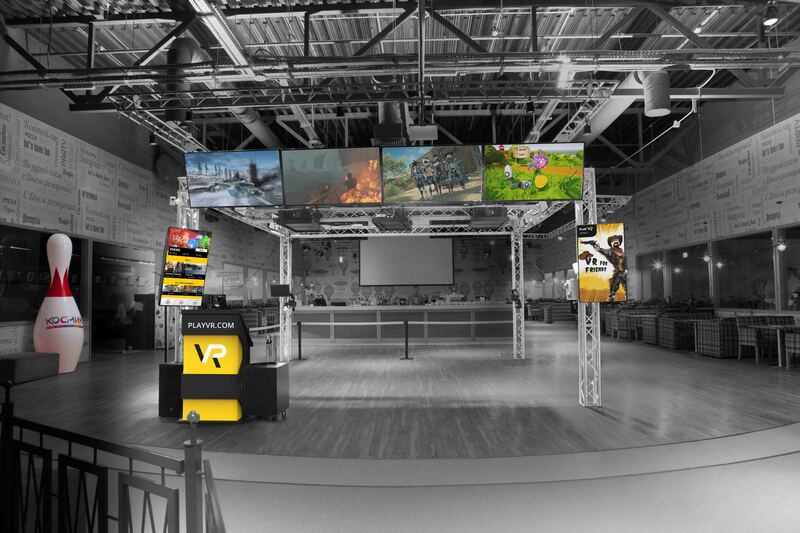 Control every aspect of the systems such as available games, ticketing, promotion, pricing, specials and so on. 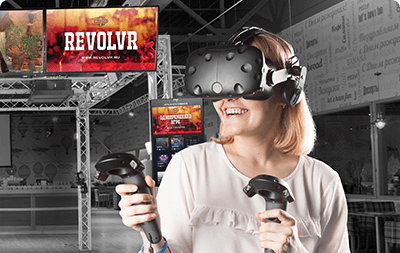 PlayVR native games run for 10 minutes: control your queue. 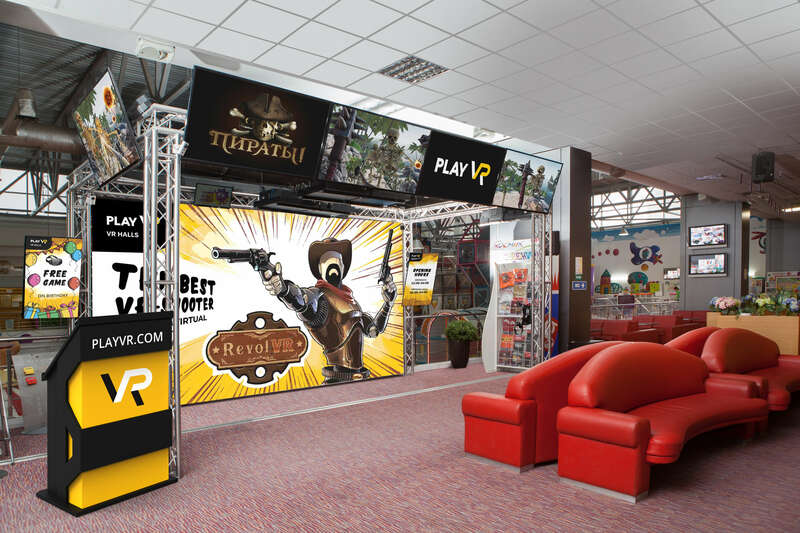 PlayVR supports Steam games, hardware controllers and even third-party platforms if need be. 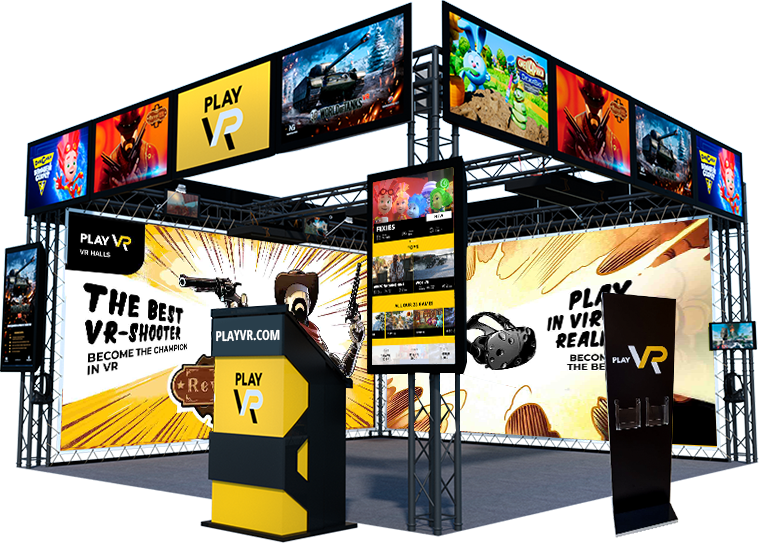 PlayVR games are designed for high replayability. They will return, and in greater numbers. Easily launched multiplayer games are designed for two, three or four players. The choice is yours. Here is what existing installations look like. Throughout the world. By the end of 2018 - even more.